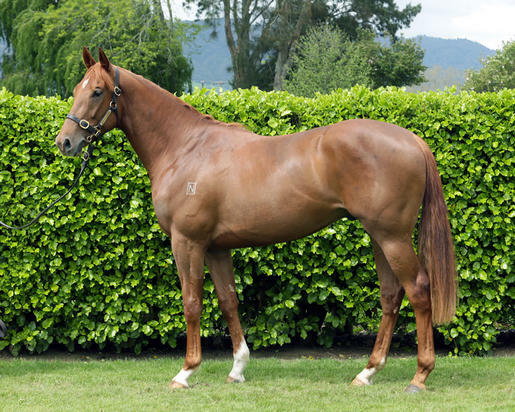 SUPER EASY (NZ) (Bay 2008-Stud 2013). Horse of the Year in Singapore in 2012. 15 wins-1 at 2-from 1000m to 1600m, NZ$63,025, S$2,113,547, Singapore Guineas, L, Singapore TC Lion City Cup, L, 3d Singapore TC Krisflyer International Sprint, Gr.1. Half-brother to SW Tiger Tees, SW Terravista and SW Ball of Muscle. Sire of SW Prom Queen (CJC Welcome S., L) and of the placegetters Easy Beast, Firestarter, Holyfield, Landsdowne Lass, Lisdoonvarna, Sheeznoteasy, Way Too Easy, etc. His oldest progeny are 3YOs. Mr Gourmet (g. by Thorn Park). Winner at 1000m, HKJC Gascoigne H., 2d HKJC HKU Foundation H., 3d HKJC Prosperity H., Absolute Champion H., Entrapment H.
Sea Treasure. 6 wins at 1650m, 1800m, HK$3,282,000, HKJC New York H., Cameron H., Carpenter H., Lotus H., Robin H., Nathan H., 2d HKJC Grampian H., Somerset H., Nakayama H., 3d HKJC Nathan H., Tai Ho H., Man Yiu H.
Monalusive. 3 wins at 1600m, 2200m, TRC Sellers Muldoon Benton P., TTC Old Scotch Collegians P., 2d TTC Water Dynamics P., 3d TTC Fashions for Fillies P., EA (Ted) Picket Memorial H.
Additionally. 2 wins at 1900m, 2000m in NZ. How Good is This. Winner at 1600m in Aust. Aaragon. Winner at 1200m, Singapore TC Panasonic I-Pro S., 2d Singapore TC Raffles l'Ermitage Beverley Hills, California H., Class 4 H.
G W'S CAPOTE (Capote). 5 wins-1 at 2-from 6f to 8½f, Fair Grounds Mississippi Futurity, L.
NELSON (Seattle Slew). 7 wins, US$220,642, Louisiana Downs Ark-La-Tex H., Gr.3, Alysheba H., L, Oaklawn Park Fifth Season S., L, 3d Louisiana Downs Ark-La-Tex H., Gr.3. Sire. CHOKAI CAROL (Brian's Time). 4 wins from 1800m to 2400m, 291,051,000¥, Toyota Sho Chukyo Kinen, L, Tokyo Yushun Himba, L. Producer. CHURLISH CHARM (Niniski). 5 wins from 1½m to 2m, £151,781, 86,000fr., Yorkshire Cup, Gr.2, 2d Doncaster Cup, Gr.3, Sandown Henry II S., Gr.3, 3d Yorkshire Cup, Gr.2, Curragh Cup, Gr.3, Maisons-Laffitte Prix du Carrousel, L, 4th Longchamp Prix du Cadran, Gr.1. Sire. LEADERSHIP (Selkirk). Champion Older Male in Italy in 2003 (Long). 5 wins-1 at 2-from 1400m to 2400m, £79,628, €246,400, Gran Premio di Milano, Gr.1, Windsor Berkshire S., L, Haydock Golborne H., York Motability Supported by Royal Sunalliance H., Sandown Barclaycard 2YO S., 2d Kempton September S., Gr.3, 3d Royal Ascot King George V H., York John Smith's Cup. Sire. HAVANT (Halling). 2 wins at 2, Newmarket Oh So Sharp S., Gr.3, 2YO Fillies S., 2d Grand Prix de Fontainebleau, 3d Calder La Prevoyante H., Gr.3. Producer. CENSUS (Cacique). 3 wins-1 at 2-from 1m to 13¼f, Newbury Geoffrey Freer S., Gr.3, Scope H., 2d Newmarket Bahrain Trophy, Gr.3, Royal Ascot King George V S.
TABLE MESA (Comic Strip). 7 wins-1 at 2-from 6f to 1m, Turf Paradise Ann Owens Distaff H., L, 2d Turf Paradise Arizona Breeders' Futurity (2YOf), L. Producer. COFFEE CLIQUE (Medaglia d'Oro). 7 wins-1 at 2-from 7f to 8½f, US$1,063,988, Belmont Just a Game S., Gr.1, Churchill Downs Churchill Distaff Turf Mile S., Gr.2, Parx Racing Dr James Penny Memorial H., Gr.3, Woodbine Selene S., Gr.3, 2d Churchill Distaff Turf Mile S., Gr.2, Gulfstream Park Secret Grace S., L, 3d Gulfstream Park Honey Fox S., Gr.2, Woodbine Ontario Colleen S., Gr.3, 4th Woodbine Dance Smartly S., Gr.2, Belmont Noble Damsel S., Gr.3, Gulfstream Park Herecomesthebride S., Gr.3. BEST MEMBER (Manhattan Cafe). 4 wins-1 at 2-from 1800m to 2200m, 125,983,000¥, Kyoto Shimbun Hai, Gr.2, Hanshin Wakaba S., L, 4th Kyoto Daishoten, Gr.2, Hanshin Asahi Challenge Cup, Gr.3, Kyoto Kisaragi Sho, Gr.3, Kyoto Nisai S., L.
SLEEK GOLD (Mr. Prospector). 3 wins at 2, Atlantic City Smithville S., L, 3d Meadowlands Nutley S., L. Sire. SLEEK FEET (Seattle Slew). 8 wins, US$263,310, Aqueduct Princessnesian S., L, Hialeah Miami Springs S., L, 2d Churchill Downs Falls City H., Gr.3, Hialeah Coral Gables H., L. Producer. BIG BANE THEORY (Artie Schiller). 4 wins from 6½f to 9f, US$395,724, Santa Anita City of Hope Mile S., Gr.2, Allowance, 2d Del Mar Harry F Brubaker S., L, 4th Hollywood Park Citation H., Gr.2, Santa Anita Sir Beaufort S., Gr.2, California Cup Turf Classic S., L, Crystal Water S., L.
LAUS DEO (Medaglia d'Oro). 3 wins-1 at 2-at 7f, 8¼f, Aqueduct Count Fleet S., L.
HIGHLAND HAPPENING (Highland Blade). 9 wins, US$209,158, Suffolk Downs Hannah Dustin H., L, Drumtop H., L.